19 So Gideon and the hundred men who were with him came to the outskirts of the camp at the beginning of the middle watch, when they had just set the watch. And they blew the trumpets and smashed the jars that were in their hands. 20 Then the three companies blew the trumpets and broke the jars. They held in their left hands the torches, and in their right hands the trumpets to blow. And they cried out, “A sword for the Lord and for Gideon!” 21 Every man stood in his place around the camp, and all the army ran. They cried out and fled. 22 When they blew the 300 trumpets, the Lord set every man's sword against his comrade and against all the army. 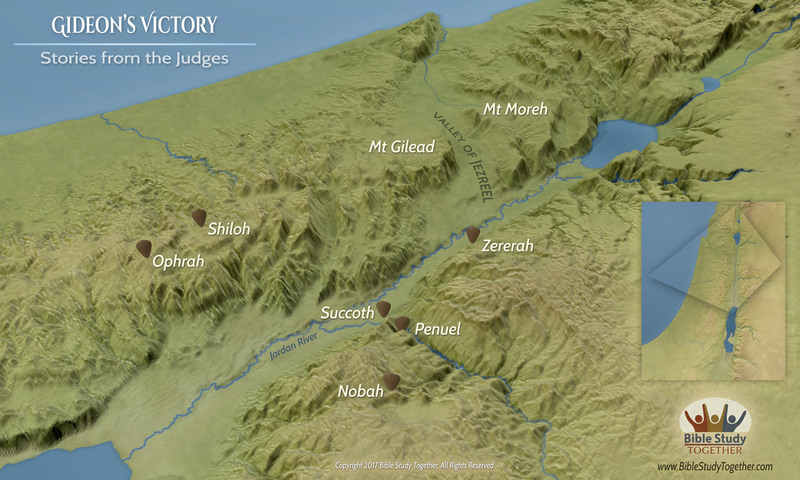 And the army fled as far as Beth-shittah toward Zererah, as far as the border of Abel-meholah, by Tabbath. 23 And the men of Israel were called out from Naphtali and from Asher and from all Manasseh, and they pursued after Midian. 1Then Jerubbaal, who is Gideon, and all the people that were with him, rose up early, and pitched beside the well of Harod: so that the host of the Midianites were on the north side of them, by the hill of Moreh, in the valley.2And the LORD said unto Gideon, The people that are with thee are too many for me to give the Midianites into their hands, lest Israel vaunt themselves against me, saying, Mine own hand hath saved me.3Now therefore go to, proclaim in the ears of the people, saying, Whosoever is fearful and afraid, let him return and depart early from mount Gilead. And there returned of the people twenty and two thousand; and there remained ten thousand.4And the LORD said unto Gideon, The people are yet too many; bring them down unto the water, and I will try them for thee there: and it shall be, that of whom I say unto thee, This shall go with thee, the same shall go with thee; and of whomsoever I say unto thee, This shall not go with thee, the same shall not go.5So he brought down the people unto the water: and the LORD said unto Gideon, Every one that lappeth of the water with his tongue, as a dog lappeth, him shalt thou set by himself; likewise every one that boweth down upon his knees to drink.6And the number of them that lapped, putting their hand to their mouth, were three hundred men: but all the rest of the people bowed down upon their knees to drink water.7And the LORD said unto Gideon, By the three hundred men that lapped will I save you, and deliver the Midianites into thine hand: and let all the other people go every man unto his place.8So the people took victuals in their hand, and their trumpets: and he sent all the rest of Israel every man unto his tent, and retained those three hundred men: and the host of Midian was beneath him in the valley.9And it came to pass the same night, that the LORD said unto him, Arise, get thee down unto the host; for I have delivered it into thine hand.10But if thou fear to go down, go thou with Phurah thy servant down to the host:11And thou shalt hear what they say; and afterward shall thine hands be strengthened to go down unto the host. Then went he down with Phurah his servant unto the outside of the armed men that were in the host.12And the Midianites and the Amalekites and all the children of the east lay along in the valley like grasshoppers for multitude; and their camels were without number, as the sand by the sea side for multitude.13And when Gideon was come, behold, there was a man that told a dream unto his fellow, and said, Behold, I dreamed a dream, and, lo, a cake of barley bread tumbled into the host of Midian, and came unto a tent, and smote it that it fell, and overturned it, that the tent lay along.14And his fellow answered and said, This is nothing else save the sword of Gideon the son of Joash, a man of Israel: for into his hand hath God delivered Midian, and all the host.15And it was so, when Gideon heard the telling of the dream, and the interpretation thereof, that he worshipped, and returned into the host of Israel, and said, Arise; for the LORD hath delivered into your hand the host of Midian.16And he divided the three hundred men into three companies, and he put a trumpet in every man's hand, with empty pitchers, and lamps within the pitchers.17And he said unto them, Look on me, and do likewise: and, behold, when I come to the outside of the camp, it shall be that, as I do, so shall ye do.18When I blow with a trumpet, I and all that are with me, then blow ye the trumpets also on every side of all the camp, and say, The sword of the LORD, and of Gideon.19So Gideon, and the hundred men that were with him, came unto the outside of the camp in the beginning of the middle watch; and they had but newly set the watch: and they blew the trumpets, and brake the pitchers that were in their hands.20And the three companies blew the trumpets, and brake the pitchers, and held the lamps in their left hands, and the trumpets in their right hands to blow withal: and they cried, The sword of the LORD, and of Gideon.21And they stood every man in his place round about the camp: and all the host ran, and cried, and fled.22And the three hundred blew the trumpets, and the LORD set every man's sword against his fellow, even throughout all the host: and the host fled to Bethshittah in Zererath, and to the border of Abelmeholah, unto Tabbath.23And the men of Israel gathered themselves together out of Naphtali, and out of Asher, and out of all Manasseh, and pursued after the Midianites.24And Gideon sent messengers throughout all mount Ephraim, saying, Come down against the Midianites, and take before them the waters unto Bethbarah and Jordan. Then all the men of Ephraim gathered themselves together, and took the waters unto Bethbarah and Jordan.25And they took two princes of the Midianites, Oreb and Zeeb; and they slew Oreb upon the rock Oreb, and Zeeb they slew at the winepress of Zeeb, and pursued Midian, and brought the heads of Oreb and Zeeb to Gideon on the other side Jordan. 10The LORD shall reign for ever, even thy God, O Zion, unto all generations. 1Paul, a servant of God, and an apostle of Jesus Christ, according to the faith of God's elect, and the acknowledging of the truth which is after godliness;2In hope of eternal life, which God, that cannot lie, promised before the world began;3But hath in due times manifested his word through preaching, which is committed unto me according to the commandment of God our Saviour;4To Titus, mine own son after the common faith: Grace, mercy, and peace, from God the Father and the Lord Jesus Christ our Saviour.5For this cause left I thee in Crete, that thou shouldest set in order the things that are wanting, and ordain elders in every city, as I had appointed thee:6If any be blameless, the husband of one wife, having faithful children not accused of riot or unruly.7For a bishop must be blameless, as the steward of God; not selfwilled, not soon angry, not given to wine, no striker, not given to filthy lucre;8But a lover of hospitality, a lover of good men, sober, just, holy, temperate;9Holding fast the faithful word as he hath been taught, that he may be able by sound doctrine both to exhort and to convince the gainsayers.10For there are many unruly and vain talkers and deceivers, specially they of the circumcision:11Whose mouths must be stopped, who subvert whole houses, teaching things which they ought not, for filthy lucre's sake.12One of themselves, even a prophet of their own, said, The Cretians are alway liars, evil beasts, slow bellies.13This witness is true. Wherefore rebuke them sharply, that they may be sound in the faith;14Not giving heed to Jewish fables, and commandments of men, that turn from the truth.15Unto the pure all things are pure: but unto them that are defiled and unbelieving is nothing pure; but even their mind and conscience is defiled.16They profess that they know God; but in works they deny him, being abominable, and disobedient, and unto every good work reprobate. Why did God tell Gideon that there was too many people with him? What was the outcome in the story of Gideon for those whose trust was in princes and those whose trust was in the God of Jacob? What has God removed from your life to cause you to rely upon Him? How did the Cretans who profess to know God deny Him by their works? Gather with others to sing and praise God.